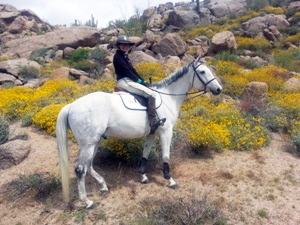 We are an equestrian facility in North Scottsdale Arizona. We provide a 10 acre modern facility that makes the perfect home for you and your horse whether you are a casual rider wanting to better your riding skills or you are pursuing your dreams on the show circuit. Our Equestrian Facility features a large lighted riding arena, a jumping arena, a dressage court, a smaller enclosed arena, a 1/2 mile exercise track and much more with quality horse care provided 7 days a week. Our boarding plans start at $565.00. a month and offer many features including a high-pressure misting system, Inside hot and cold wash racks, and large boarder’s tack-rooms with racks and storage.